Wash the strawberries and pat dry them. Remove stems and cut into halves. Add milk, ice cream and halved strawberries in a blender jar. If you like, you can add 1 teaspoon sugar or honey for extra sweetness. Blend until smooth puree. Pour it into serving glasses. Garnish with strawberry and serve. 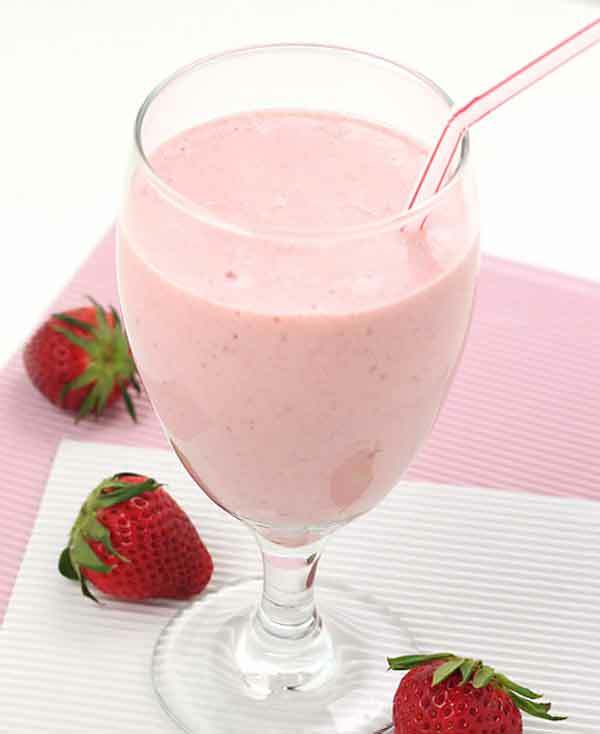 Use frozen strawberries to make thick milkshake. Add more ice cream and less milk make it thicker and creamier. This recipe does not prepare very sweet shake to allow strawberry flavor to be strong. However, if you like sweeter taste, then increase the quantity of sugar according to your taste. Serving Ideas: Strawberry shake prepared with milk and honey is a best drink for kids party. Savor its flavorful taste and creamy texture as breakfast drink or party drink, reports Foodviva.com.